The Writing Bug: Monday Rerun: What's Your Salad Style? Monday Rerun: What's Your Salad Style? I love a good salad bar—though I’m also a moderate germaphobe, so I won’t eat at them during flu season. 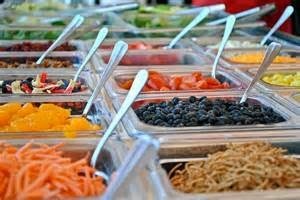 I’ve noticed that there are two basic types of salad bar folks: the people who take a little bit of everything, and the people who take a larger quantity of a few favorite items. I’m a proud member of the former group, but hold the croutons. I get it from my mother, who is a salad architect. She can build a salad like nobody’s business. In fact, she was once jokingly told by a waiter that the salad bar was intended to be all she could eat, not all she could carry. My husband belongs to the second group—lettuce, cheese, carrot sticks, a tiny bit of dressing (or even a squeeze of lemon) and he’s set. Our older son is following in my footsteps. He’ll try at least a bite of almost anything. Our younger son is a salad minimalist like his dad. But without the lettuce. He has honestly tried to convince me that cheese counts as a vegetable. The same holds true for writers. Some writers stay within their chosen genre and work on one project at a time. Others experiment with different styles and may have many WIPs at once. And how about the clean plate/clean slate club? Some of us feel obligated to clear our first salad plate before going back for more. Some of us don’t. Some of us finish every book or project we start, regardless. Some of us move on down the list as soon as our interest in a book or project begins to wane. The great thing is, neither method is right or wrong. We simply have different preferences. So, tell me: which type are you? Does the same hold true for your salad-bar-eating, your reading, and your writing? And should Jello ever actually be considered a salad? Good post, Jenny. I'm the "pile it on" type whether we're talking about salads, books to read, or writing projects in the works. And by the way, I'm on your son's side. Cheese is definitely a vegetable. I'll take whatever looks good at the salad bar, bookstore, and writing project, and if there happens to be chocolate mousse at that salad bar, hand me an extra plate. Jello is one of those grey areas. Is it a dessert or a salad? Or maybe a mystery food group?